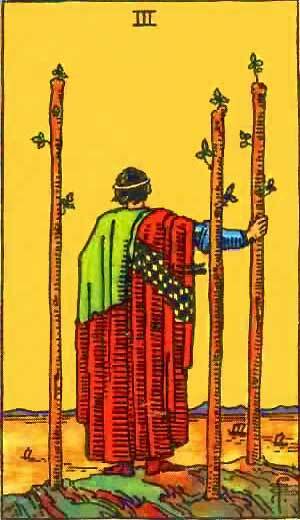 The Three of Wands in a Tarot reading is a very positive indication of a good relationship that is also an ambitious business partnership with material gain after something of a struggle. In the reversed position there are still positives indicating that cooperation will lead to gains, however, watch out for over confidence. A calm, stately personage, with his back turned, looking from a cliff’s edge at ships passing over the sea. Three staves are planted in the ground, and he leans slightly on one of them. He symbolizes established strength, enterprise, effort, trade, commerce, discovery; those are his ships, bearing his merchandise, which are sailing over the sea. The card also signifies able co-operation in business, as if the successful merchant prince were looking from his side towards yours with a view to help you. The end of troubles, suspension or cessation of adversity, toil and disappointment. A very good card; collaboration will favour enterprise. Three of Sceptres – Enterprise, Undertaking, Commerce, Trade, Negotiation. Enterprise, effort, essay, trade, commerce, discovery, usurpation, daring, temerity and also imprudence, interruption, cessation and ‘the end of troubles,’ discontinuative. The rather contradictory descriptions of this card’s significance are well explained by its zodiacal position: Air on the Third house, which doubles the influence of ‘air’ and of the mercurial vibrations and effects. This card has the accent of the suit of wands. It must consequently denote: communication, reflection and all that comes from these. This needs little explanation. The radiant triangle encloses a lamp, symbol of Understanding, represented by the number 3 in Qabalah. The three wands form a fire triangle, and suggest the enclosure of power in form. 2nd decanate of Aries, March 31st to April 9th, ruled by the Sun. Mental energy, leadership, ambition, determination are among the meanings. It is also a card of the realization of hope, of success after struggle. More information on the Three of Wands Tarot card. This entry was posted in Tarot, Runes and Divination and tagged astrology, energy, feelings, love, mercury, tarot, the sun, three of wands, vibration, wands. Bookmark the permalink.